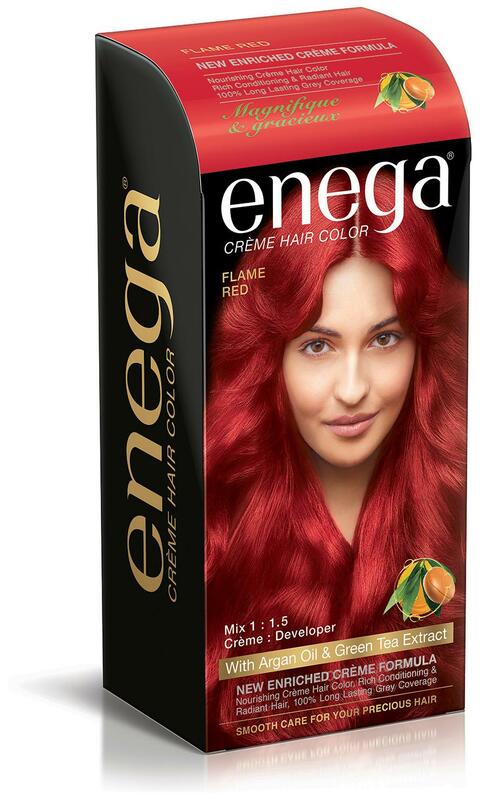 Package includes- 2 Enega 60x2 ml Developer Bottle;2 Enega 40x2 gm hair Colorant Tube;4 sachets of 6ml Conditioner;2 pair hand gloves and 2 instruction leaflet for home use. Nourishing Cream hair color with the goodness of Argan oil and green tea extract. Color protect conditioner ensures prolonged color-stay on hair. Specially designed for smooth care of your precious hair. Available in 13 shades - NATURAL BLACK 1;ORIGINAL BLACK 2;DARK BROWN 3;CHOCOLATE BROWN 3.5;NATURAL BROWN 4;GOLDEN BROWN 4.3;LIGHT BROWN 5;HONEY BLONDE 7.3;GOLDEN BLONDE 8.1;BURGUNDY 3.16;MAHOGANY 5.5;COPPER RED 5.64;FLAME RED.